There is a group called the Fellowship of the Inexhaustible Cup, which is “a non-profit organization of men and women who seek to maintain and develop sobriety and chastity and are committed to a daily prayer rule of about six or seven minutes, where we pray for one another using the akathist prayers to the Mother of God, the Inexhaustible Cup.” This is led by an Orthodox priest named Fr. Christophe Lepoutre and he has starred a podcast called “Healing Addictions“. The fellowship believes, “that the greatest defense and the greatest movement of grace dispensed by the Holy Spirit comes from our acknowledgment of the Mother of God, the Inexhaustible Cup, and our willingness to include her, to intercede for one another and especially those afflicted with all manner of addictions”. He has first hand experience with addiction and highly values the 12-step recovery program. He will be talking about what works with the 12 Step program, but will also be including both clinical and personal pastoral counseling work, as well as a very strong emphasis on the Orthodox method of treatment for addictions. 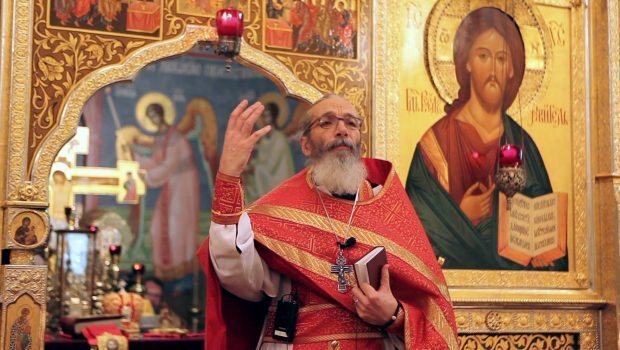 Moving beyond just physical sobriety he will discuss the value of soul sobriety, which the saints and all Orthodox Christians should be committed to, as well as acquiring a basic life of sobriety. This is not just related to alcohol, but all the various ways in which we can become addicted by choosing created things. He will also discuss the fundamental principles of Orthodox psychotherapy which is largely based off the work of Metr. Hierotheos (Vlachos). It was in discovering the ideas promoted in Orthodox Psychotherapy that transformed the life of Fr. Christophe Lepoutre. Never in his long medical career has anyone taught him about the work of the science of spiritual medicine as taught by the holy Fathers and Mothers of the holy Orthodox Church. The podcast is his attempt to teach others what he has learned.